Almost one in five children who use social networking sites suffered a negative experience last year, research by children's charity the NSPCC shows. This included bullying, unwanted sexual messages, cyber stalking and feeling pressure to look a certain way. The NSPCC also said a "large number" of users of Facebook, Twitter and YouTube were under the minimum age of 13. A full report of the survey of 1,024 11 to 16-year-olds from across the UK will be published in November. The survey also showed that the most common bad experiences among children were bullying and trolling. This involves insulting or intimidating others, usually under a pseudonym, to provoke a reaction. The NSPCC said the survey was commissioned because of increased concern around what children and young people were being exposed to on the internet. Earlier this month, 14-year-old Hannah Smith, from Leicestershire, was found hanged. 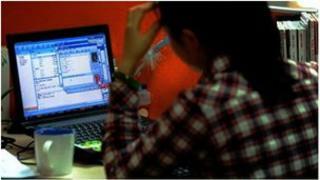 Her father said she had been sent abusive messages on social networking site, ask.fm. Claire Lilley, NSPCC safer technology expert, said: "It's unbearable to think any young person should feel there is no other option but to end their life because of bullying on social networking sites." She said their research revealed a "worrying landscape" and the charity's forthcoming report would focus on the issues of "trolling" and cyber-bullying and the impact they have on young children, in particular 11 and 12-year-olds. She said there was "a bit of a blind spot" in the way social networking sites were dealing with underage children. "This is something that must be tackled before it gets out of hand," she said. "We must ensure young people have the confidence to speak out against this abuse, so that they don't feel isolated and without anywhere to turn." Last week, Prime Minister David Cameron called on people to boycott websites that fail to tackle online abuse. Following the death of Hannah Smith, Latvia-based ask.fm ordered a law firm to carry out a "full and independent audit" of the site and its safety features. The site had 13.2 million daily visitors worldwide in June. Members can ask each other questions and then get replies, which include text, photos and videos - via its website or apps. One of its most controversial features is the ability for members to pose questions to others anonymously.